And whether or not Pope is telling us the whole story, he certainly is willing to let us see the seamier aspects of his family’s history. Pope’s grandfather, Generoso Pope, Sr., was a poor immigrant who came to this country with little money and no English language skills. Through guile, hard work, and a bit of luck he fashioned an empire in the building trades business. Eventually, he branched out into communications, buying the Italian language newspaper, Il Progresso. He also occasionally operated as a ruthless thug who, fortunately, had the backing of a mobster, Frank Costello. Generoso is also portrayed as a friend and confidant of President Franklin Delano Roosevelt who dabbled in Italian politics in the time of Mussolini, helping to defeat the communist effort to take control of the new post-war Italian republic. Generoso was a complicated man, indeed. The story continues with the tale of Generoso Pope, Jr., widely known as Gene Pope. Ousted from the family business after his father’s death by his not-so-loving mother and his two older brothers, Gene, with the help of a generous loan from “Uncle Frank” Costello, bought a failing newspaper, the New York Enquirer, which he ultimately turned into the king of all tabloids, the National Enquirer. In return for the loan, Uncle Frank asked for a few favors: that the paper stop attacking the mob in its stories, that the paper publish nice things about projects the mob was backing, and that the paper attack enemies of organized crime. 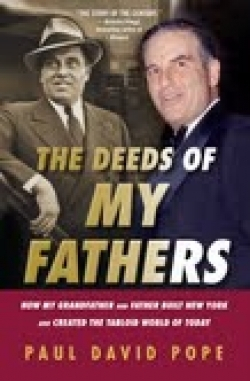 The story in The Deeds of My Fathers is supported by abundant research, including hundreds of interviews with people claiming to have been in attendance at significant points in the story. The reader must rely on the author’s assertions, however, for many of the principal participants are long dead at this point. It is perhaps fitting that The Deeds of My Fathers reads like a story from the National Enquirer. It is fast-paced, titillating, and filled with provocative and entertaining information. It is part history and part action thriller for anyone interested in the social history of 20th century America. Unfortunately, it may perpetuate a stereotype of Italian immigrants that is neither flattering nor useful to a better understanding of the overall experience of average Italians in this country. Then again, the Popes were not the average Italian family.